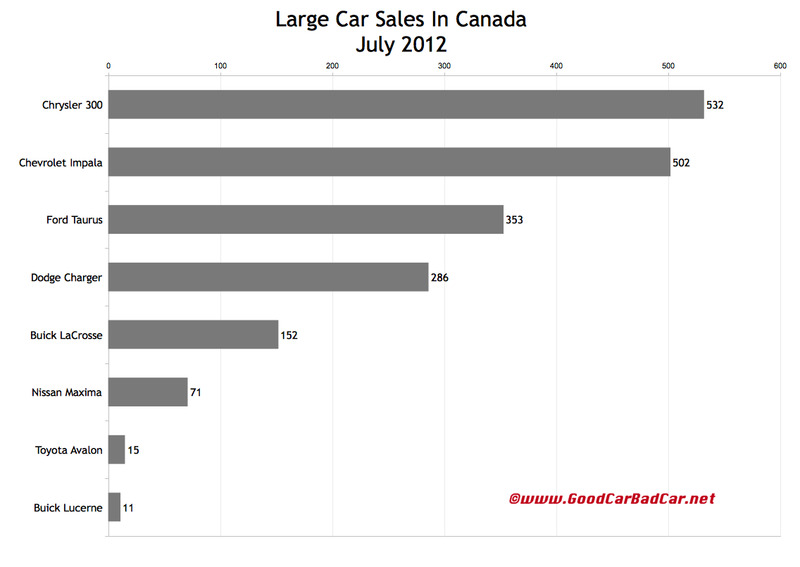 Let’s just forget that the brand new Verano and defunct Lucerne are (and are still) a part of Buick Canada’s lineup. Excluding those two cars from Buick’s overall July tally – the brand was down 19% year-over-year – we see that sales fell 49% from July 2011. Think this is just a July anomaly? LaCrosse sales dipped 17% through the first seven months of 2012; the Regal is down 19%; and Enclave sales are off last year’s pace to the tune of 11%. Overall, Buick is up 16% because the new, less costly Verano, with 3009 sales in 2012, is the brand’s best seller. A car company is expected to increase its sales volume when a new model is introduced. That’s both obvious and necessary. The bad news is that the Verano’s relative success loses some of its lustre when we consider the fact that Buick’s more expensive and presumably more profitable larger vehicles are struggling. This isn’t a problem encountered exclusively by Buick. Excluding the revamped Passat from calculations, Volkswagen Canada is down 4.4% in 2012. With the Passat, VW Canada is up 7%. Unfortunately, apart from the Beetle’s 606% increase and the Passat’s 345% improvement, sales of every other VeeDub Canada model are down. And the company’s best-selling vehicle, the Jetta, is down 12%. That’s a decline of 1909 sales. The good news at Volkswagen relates to the Passat’s timing: the sliding Jetta sales are timed with an increase in sales of a more expensive product, the Passat, sales of which have risen by 3536 extra units. 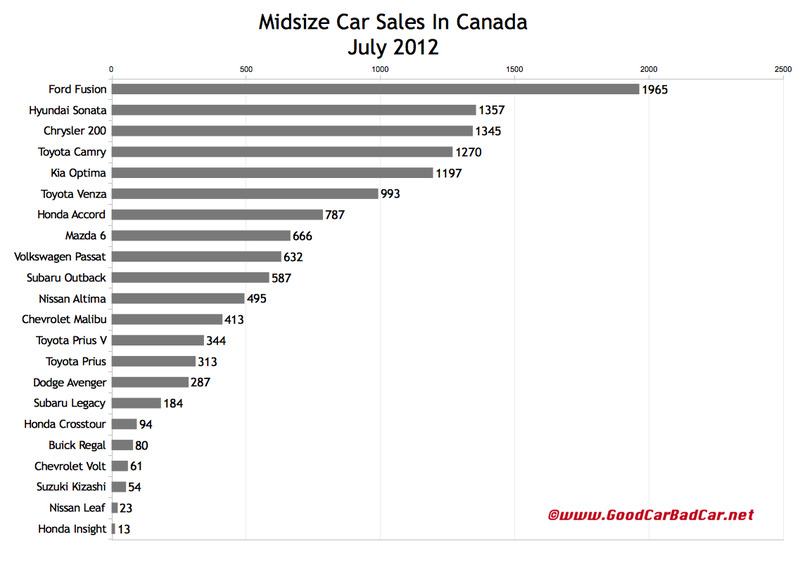 Keep in mind, unlike the U.S. figures, Canadian Passat sales include the CC. 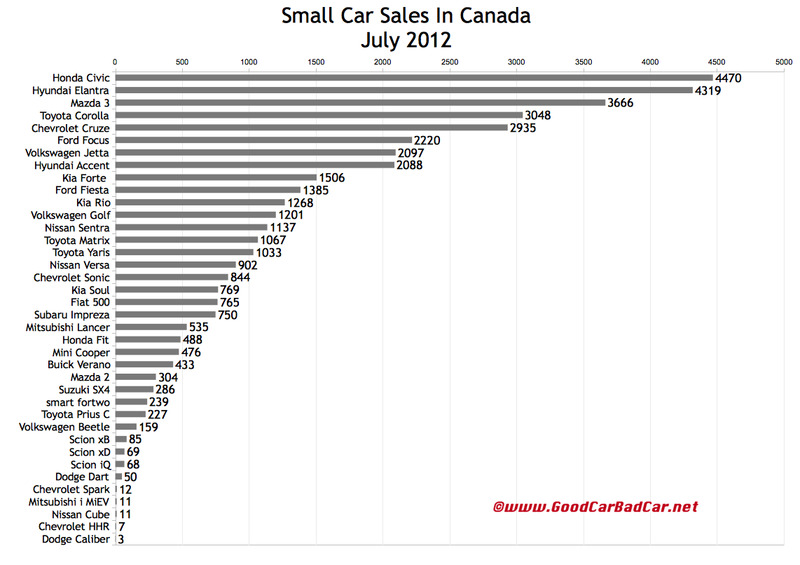 Canada’s best-selling small car in July was the Honda Civic. Scroll down a bit more and you’ll see that Canada’s best-selling midsize car was the Ford Fusion, though Toyota’s Camry leads the seven-month standings. Chrysler 300 sales shot up 142% in July to 532, 30 more than even Chevrolet’s Impala managed. Historical monthly and yearly sales figures for all these models can be accessed through the first dropdown menu at GCBC’s Sales Stats home. It’s a free database. After the jump you’ll find detailed July and year-to-date results for small, midsize, and large cars. Granted, the Fiat 500 isn’t a direct competitor of the Buick Verano, nor is the Toyota Venza a pure Nissan LEAF rival, but cars are ranked in three general groups in the accompanying charts.